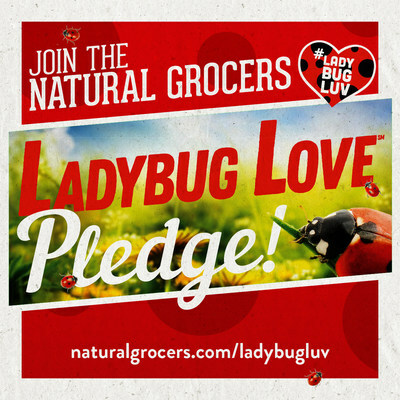 DENVER, April 5, 2018 /PRNewswire/ -- Throughout the month of April, and in celebration of Earth Day on April 22, Natural Grocers will invite the community to pledge to protect one of nature's beneficial insects – the ladybug. Shoppers will vow to never use chemicals that harm ladybugs or other beneficial insects and pledge to support 100 percent organic produce. Customers will also learn how to make a natural, do-it-yourself weed killer at a free, educational class hosted by Natural Grocers. Use the store locator to find the time of the class at your favorite Natural Grocers' store. "We are dedicated to protecting the environment – because the health of the environment is directly linked to the health of the economy, and the health of all people," said Heather Isely, Natural Grocers' Executive Vice President. "This Earth Day, Natural Grocers selected the ladybug as its mascot because it symbolizes the importance beneficial insects play in the overall health of the economy and environment." In addition to the pledge, Natural Grocers will hold a 3-day sale from April 20 to 22 featuring products from a variety of environmentally friendly suppliers. During the sale, Natural Grocers will offer customers a free reusable shopping bag with purchase and the chance to win Natural Grocers gift cards. "Where you buy your food is an important decision, it can either support a healthy economy and environment or it can drive degenerative practices," added Isely. "With the products we choose to carry and the green building practices we implement at each store, we provide consumers with a place that supports a healthy future for our planet." Bagless checkouts; no disposable plastic bags provided. This was implemented on Earth Day in 2009, and more than 250 million bags have been kept out of landfills! Sell only USDA Organic produce. Natural Grocers offers 100-percent organic produce, all meat is humanely raised without antibiotics, hormones or other growth promotors, 100-percent free-range eggs, 100-percent pasture-based dairy, non-GMO prepackaged bulk products, groceries that don't contain any artificial colors, flavors, sweeteners or preservatives and more. Natural Grocers is also committed to supporting regenerative farming practices that support the triple bottom line. Natural Grocers by Vitamin Cottage, Inc. (NYSE: NGVC; NaturalGrocers.com) is an expanding specialty retailer of organic and natural groceries, body care and dietary supplements. The company offers a flexible, neighborhood-store format, affordable prices and free, science-based nutrition education programs to help customers make informed health and nutrition choices. Founded in Colorado in 1955, Natural Grocers has more than 3,000 employees and operates 145 stores in 19 states.